The landing page is gone, but your card concierge should be able to process upgrades...for now. Back in October 2018 I wrote about how World Elite Mastercard holders could get free GHA Black elite status, the highest tier available in the program. GHA may not be the best known loyalty program, but has high quality chains like PARKROYAL, Anantara, OMNI and Pan Pacific under its umbrella, and a total of ~550 properties in 77 countries. In order to get GHA Black, you’d need to create an account and contact the concierge listed on the back of your World Elite Mastercard to ask them to process the upgrade. Further details used to be available on the GHA website, but the link has been taken down. This doesn’t mean the benefit has been pulled, however. The original T&C stated that the offer is available for registrations made until 31 December 2019, and indeed, people in our Telegram Group are still reporting successful processing. The removal of the landing page does make me skittish though, so I’d advise you to get your upgraded status now rather than later. Once registered, your status is valid until 31 December of the following year. In other words, registering now would score you GHA Black status for just under 2 years (31 December 2020 expiry)- there’s really no more incentive to delay. Update: it appears that status granted through this program is valid till Feb 2021! Based on datapoints provided in the Citi Prestige Telegram Group, most account upgrades are processed within one week. The Citi Prestige concierge can be reached at 6337-2484. If you’re a Prestige cardholder, be sure to speak to the Aspire concierge, not the Citibank side. GHA doesn’t work like a traditional hotel rewards program where you earn points towards future stays. Instead, your stays earn you “local experience awards”. Members receive one Platinum/Black Local Experience award upon reaching Platinum/Black status, and another each year their status is renewed. Platinum and Black members earn subsequent Local Experience awards each time they stay at a new DISCOVERY hotel brand. In addition to supposedly better Local Experiences, GHA Black status also grants you some traditional elite status benefits during your stay such as room upgrades, early check-in and late check-out. You do not get a Local Experience award if your account is automatically upgraded to GHA Black under the World Elite Mastercard program. Even if you don’t see yourself staying at GHA properties a whole lot, GHA Black status can still be useful. 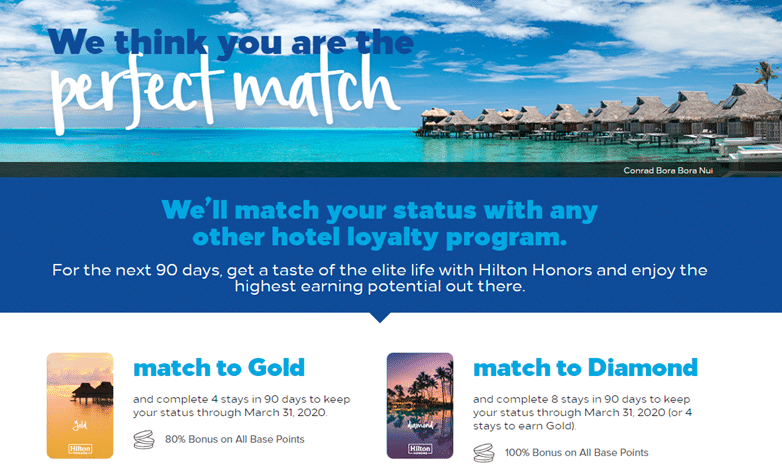 Hilton has an ongoing status match promotion which gives you instant elite status for 90 days, provided you can show proof of status and at least one stay within the last 12 months with a competing chain. 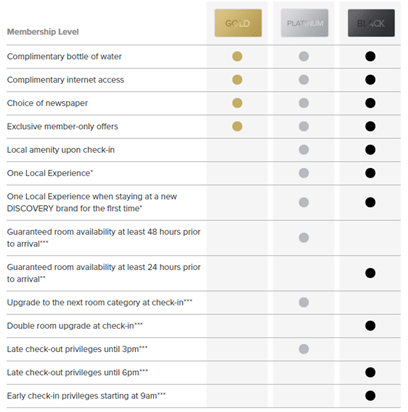 GHA is not listed as one of the hotel loyalty programs that can be matched in the drop down box, but I’ve received reports that Hilton will indeed offer GHA Black members instant Diamond status, if you submit your proof of status and stay. In order to retain Hilton Diamond status after 90 days, you’ll need to make at least 8 stays during the period. Once earned, your status will be good till 31 March 2020. If you fall short of the 8 stay requirement, you can still secure Gold by making 4 stays (or get an AMEX Platinum Charge, if that floats your boat). Other chains which offers status matches include Best Western and Wyndham Rewards. If you’re trying to access the landing page for the GHA Black/ World Elite Mastercard promotion and see it’s gone- don’t panic! But don’t delay either, because the removal of the landing page tends not to be a harbinger of good things. Is the BOC world elite miles counted? Any idea if the OCBC Premier World Elite Mastercard is eligible for this offer? Besides Citi P MC, and probably OCBC Premier World Elite MC, is/are there any other local bank(s) that have World Elite MC? I called and was told by the officer that this was something I needed to bring up with MasterCard. is SC Manhattan counted? As it is only World though. If i have got a status upgrade to gold via visa fast track, can i still enjoy the fast track to diamond via GHA black status with 8 stays. @Greg.. Unless something’s changed, Hilton doesn’t recognize GHA.. What I did was to use GHA Black, matched to Wyndham Diamond, stayed one night, and then got matched to HHilton Diamond.. Does OCBC World Elite work? thanks! it’s working for me too. Anyone knows if the supplementary card holder is eligible to apply for the GHA Black status too? Next Entry Marriott Rewards to be rebranded as Marriott Bonvoy – what’s changing?